Eyeing up the ‘victory beacon’ from a rare break in the trees during the ascent. Mountain Biking – you can do it anywhere. At a purpose built bike park. Down some stairs in town. Even on the road. But there’s times when you need to put the mountain back into mountain biking. 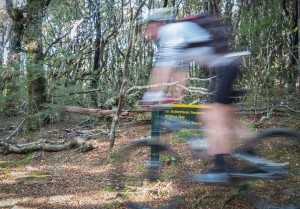 For keen back-country MTB warriors, Marlborough has mountains aplenty. Mount Robertson, looming large above Port Underwood, is surely one of the most alluring. At not much higher than 1000 metres, I surmised the peak to be easily attainable for a semi-fit person. 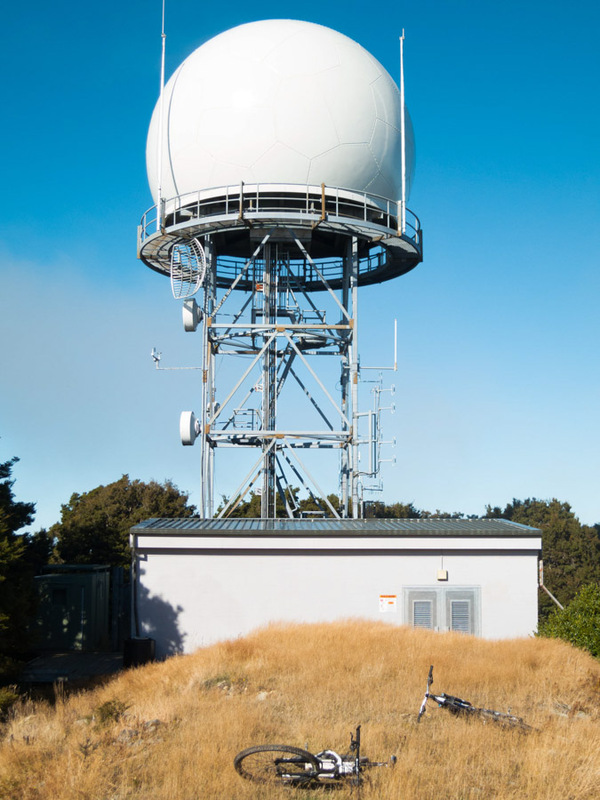 That summit, with its golf ball-like radar atop, begged to be conquered. And to top off a cruisey day on the bike, there was the promise of a swim at Whites Bay at journey’s end. That was the plan. We departed the bay and were straight into the first climb of the day, a dull gravel slog up Port Underwood Road. It seemed the mountain was using boredom as its initial strategy to avoid conquest. When we eventually reached the top of the road the proper mountain biking began. A sign led us off the gravel up a slightly daunting 4wd track. 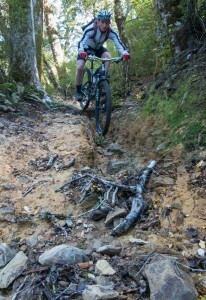 Toiling upward in the granny gear, steep soon gave way to sheer. Our small party were systematically dethroned. The climb defeated me near its crest, my front wheel lifting skyward and dismissing me onto my backside – not before the pedal gave me a sharp whack across the shin. The claret had started flowing early as the behemoth laughed at the pitiful humans upon their metal toys. We trudged up to a clearing and caught our breath, considering the notion that perhaps we’d underestimated this outing. But the mountain caught its breath too, for the path flattened out, narrowed and gave up a short stretch of nice twisty singletrack. We hadn’t time to get our hopes up though before the mountain’s major weapon, gravity, was again out in force. We countered with sugary fuel. Although we were gaining altitude, the track was cutting up. Now, hefty rocks and ruts had to be contended with, not only burning legs. So it was with relief when we reached another logical rest stop, the junction between the loop track (leading back down to Whites Bay) and the summit route. The mountain was presenting us with a chance to admit defeat – an opt-out route back home with our tails between our legs. Rested and overconfident, I scorned the prideful offer and we thus proceeded up the summit route. The trail flattened out, indicating that the mountain had exhausted its arsenal. Surely we were almost victorious, yet there was still no indication of either thinning beech or giant golf ball. Instead there were signs the beast was planning another assault. And when it came it was more brutal than before. Gravity. Roots. Boulders. Burning lungs. Leaden limbs. Dismount. Trudge. Remount. Fall off. Trudge. Slog. Toil. Stop. Go. Stop. Go. There wasn’t even a panoramic view to distract us, and like Bilbo in Mirkwood, no sign to the end of the drudgery. The cursed mountain had saved its best, most torturous, until last. But it hadn’t reckoned on the mountain bikers secret weapon – an expectation of the descent. Because surely, if we made it to the top, this would be one helluva downhill. And we wanted it from the top. So, fuelled by the promise of an exhilarating ride down, we finally emerged into the summit clearing. The colossal golf ball shone in the sun like a victory beacon. We clambered a little higher to try to get a view over the undergrowth. The mountain however proved a sore loser, managing to summon some wispy clouds in another effort to thwart us. After an overload of provisions and much loitering it was time to head home. The legs felt like jelly and the chief danger now was a lethargy that could result in a trip over a cliff. 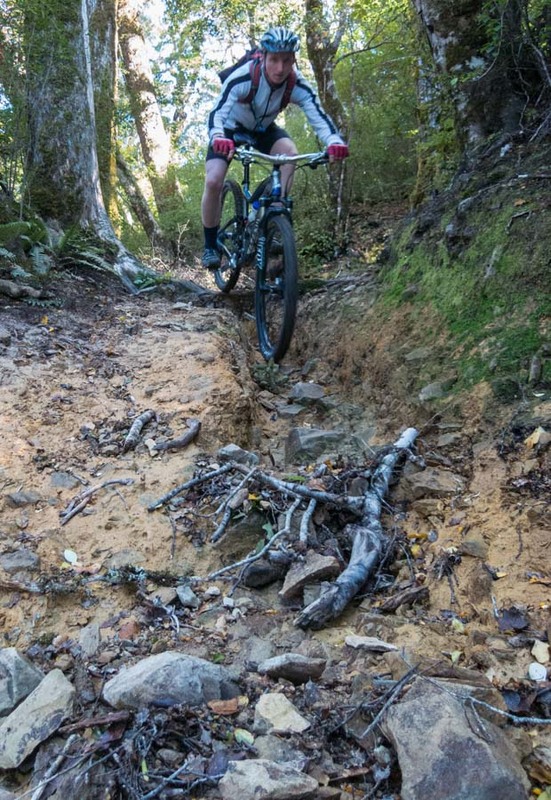 But any concern was unfounded – bombing down the steep switchback trail was like an adrenaline shot. We gloried in soaring over the cruel obstacles that had so burdened us on the ascent. We had an occasional stop just to laugh at how good it was, to stretch it out and to reflect how the earlier grind had been so very worth it. The trail had great variation too. Long high speed sweepers. Ultra-narrow tightropes. Zig-zag drop offs. Even the odd pinch climb to make us further appreciate this exquisite descent. We rode well within our limits though, wary of the mountain lulling us into a false sense of security and delivering a final attack. But it never came. Unscathed, we blasted out of the forest canopy, back onto Port Underwood Road and down to the car. The ride was over and Mt Robertson had been defeated. Now, about that refreshing swim at Whites Bay? Hmmm – maybe not. Not quite brave enough for that. A hot shower at home sounded much nicer. Gently does it. The trail clutter threatens. Disclaimer – It is a reasonably tough climb up to the summit. Although I jokingly make it sound like not choosing to head up top is a weak choice, it is absolutely the right choice if you have any doubts about your ability – or if the weather is inclement. 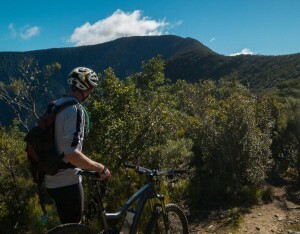 Indeed, just doing the loop is probably the best choice for most mountain bikers. The loop track excludes the least enjoyable sections of the track, hard slogs where you’ll have to push your bike. And you’ll still get a great run home. Hurtling past the opt-out point in victory. This is where, on the ascent, the defeated can elect to slink downwards to comfort and safety.